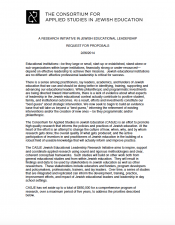 The CASJE Jewish Educational Leadership Research Initiative aims to inspire, support and coordinate applied research using sound and rigorous methodologies and clear, coherent conceptual frameworks. Such studies will build on other work both from general educational studies and from within Jewish education. They will result in findings and data to be used by stakeholders in Jewish education as well as other researchers. These stakeholders include educators and funders, program developers and policymakers, professionals, trainers, and lay leaders. Over time, a series of studies that are integrated and replicated can inform the development, training, practice, improvement efforts, and impact of Jewish educational leaders and leadership in day school settings.